This edition comes with new developments that aim to bring a qualitative boost to the race.Particularly notable are its improved, faster and more flexible course, a children’s fun run and a considerable solidarity contribution. With over 13,500 people already signed up for the event, the Barcelona Zurich Marathon has so far seen a 4% growth on last year’s number of registered runners. 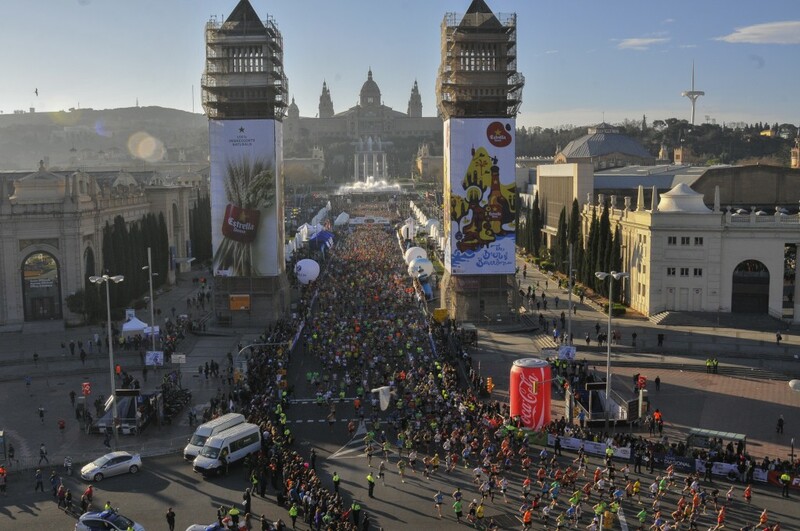 The Catalan capital will be holding a new edition of the Barcelona Zurich Marathon this coming 15 March, the city’s most spectacular urban athletics race, covering a distance of 41.195 km. So far, over 13,500 people have signed up for the long-distance event – 13,663, to be precise, by Tuesday 13 January – representing a 4% increase on the number of registered runners for the 2014 edition. The male-female ratio and countries of origin are much the same as last year’s. At present, with a month and a half still left before the registration deadline ends (6 March), 81% of the runners are men and 19% women; 51% of participants come from abroad, 40% are from Catalonia and 9% from the rest of the Spanish State. This 2015 edition sees the Barcelona Zurich Marathon entering a new era, aiming not just to increase the number of people signing up for the event but also to bring about qualitative changes to make the Barcelona race one of the best in the world. This is how the Deputy Mayor for Quality of Life, Equality and Sports, Maite Fandos, put it at the event’s presentation ceremony held today at the Cinesa Diagonal, during which she highlighted that “we are aiming and looking for excellence. Which is why we’ll be entering a new era during the 2015 edition of this marathon. We’ve committed ourselves to the Marathon’s growth, not just in number of registered participants but in quality too”. Explaining the race’s new developments and improvements, she also emphasised the event’s growing vocation for solidarity and then thanked RPM Racing, the company that had won a four-year contract from Barcelona City Council to run the executive management of a foundation expressly created for administering the event’s solidarity side. The Deputy Mayor for Sports, Maite Fandos, was accompanied at the ceremony by the CEO of RPM Racing, Joan Porcar, the Director of Marketing for Zurich Seguros, Sílvia Heras, the director of the Barcelona Zurich Marathon Race, Cristian Llorens, and by the Chairman of the Real Dreams Foundation, David Levy. One of the main new developments this year is the establishment of a faster circuit, by taking advantage of Avda Diagonal’s upward slope. The course makes a straight path through Diagonal once it has passed Avda de Sarrià up to Pl Francesc Macià. It then continues along C/ Urgell and C/ París. This will improve the circuit’s course, making it more comfortable for the runners, who will have wider avenues at their disposal by being able to use all the available lanes along Avda Gran Via, Avda Meridiana, Avda Madrid and Avda Diagonal. That way there will be more space for participants, allowing them to run in comfort and to avoid the sorts of crowding and bottle-necks that can make things difficult for the runners and block their paths. On the other hand, a new app has been created so participants, friends and family can follow the race live and the positions of the participants, as well as keep informed of the developments in the race. The race will also have a larger amount of solid and liquid refreshments (15 hydration points, located every 2.5 km after the race’s first 7.5 km, and 8 food points, after the first 15 km), which will be doubled, to offer a better service for runners. So, all these refreshments points, apart from two, will be on both sides of the road, to prevent over-crowding around them. As for cheering points, which have been designed to draw even more members of the public over to the race and get people to take to the streets to cheer on the marathon runners, the organisers will be putting up cheering points along practically every kilometre of the race. Last but not least, an improved access point to ExpoSport – the Barcelona Zurich Marathon’s runners fair – has been designed for runners and visitors, with a straighter and broader itinerary to make it easier for people to move around the grounds. The fair will be divided up into areas, so visitors can assess the various options without having to go from one end to the other. There will also be a kids’ recreation area and an eating zone that will make it a family fair, where everyone will be able to find their own space. The very young will also be able to take part, for the first time, in an athletics race designed especially for them. Offering several categories and distances (from 6 to 9 years, 500 metres; from 10 to 14 years, 1000 metres), the children’s race will be held on Saturday afternoon on 14 March, a mere day before the marathon itself. It will be one of the events taking place at the Expo Sports, the Barcelona Zurich Marathon’s Runners’ Fair. The race will set off and finish at the same point as the Barcelona Zurich Marathon, on Avda Reina Maria Cristina. The online registration period is expected to start on 1 March, via the Barcelona Zurich Marathon’s official website and children will be able to sign up for the race in person on 13 and 14 March at the same fair. One of the City Council’s aims was to a commitment to promoting a balance between the race’s sports and cultural values, while boosting cultural programmes and bringing on board sports-promotion programmes; as well as a commitment too to making the race a big party for the public and everyone accompanying the athletes. Continuing too the solidarity trend seen in practically every Barcelona race, the Barcelona Zurich Marathon will be allocating a total of 50,000 euros to several projects promoted by social organisations working in the Catalan capital, and collaborating with the Pasta Party, a social organisation, which will be explaining its project to all the participants on that day. Finally, the Barcelona Zurich Marathon and migranodearena.org are aiming to get all the runners to take part in a solidarity initiative. Participants will be able to dedicate their efforts to a solidarity cause and share it with their friends and family. That way every kilometre they run will help to improve life for many people. The way it works is very simple: just enter the website of themigranodearena.org, access the 2015 Barcelona Zurich Marathon Challenge, choose the NGO you wish to support, upload a photo, a message to cheer on the people taking part and set yourself a target for the proceeds to be collected. The challenge can be individual or by group. The challenge for each runner will be to secure donations to meet the target and therefore to share that out as much as possible; by emailing the challenge link and sharing it on social networks to as many contacts as possible.